The ADP report supported USD after the recent decline and later this week there is a possibility that the NFP data supports USD as well. Today the ECB rate announcement may also empower EUR. 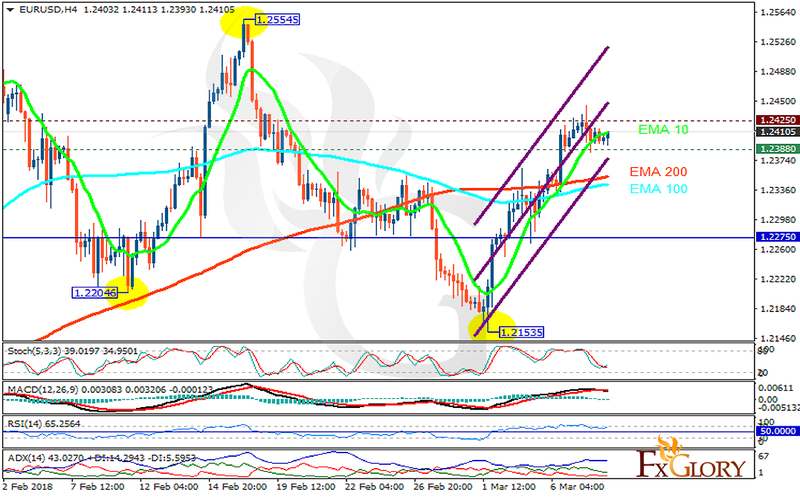 The support rests at 1.23880 with resistance at 1.24250 which both lines are above the weekly pivot point at 1.22750. The EMA of 10 is moving with bullish bias in the ascendant channel and it is above the EMA of 200 and the EMA of 100. The RSI is moving in the overbought area, the Stochastic is showing upward momentum and the MACD line is below the signal line in the negative territory. The ADX is showing buy signal. We will remain bullish until the price hits 1.25.